Every year, more than 4.5 million pilgrims pass through Katra on their way to the holy shrine. The cave shrine of Mata Vasihnodeviji or Trikuta Bhagwati (alt: 5,200 ft.) has been a beacon of faith and fulfilment to millions of devotees from all over the world. The pilgrimage to the Shrine holds great significance for the pilgrims. 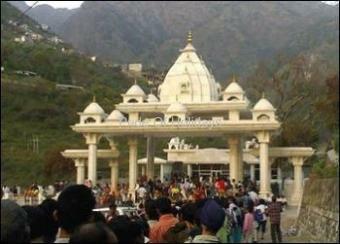 Yatra Parchi Once a pilgrim reaches Katra he has to obtain a yatra permit from the permit counter of Shri Mata Vaishno Devi Shrine Board. The Permit counter is located adjacent to the Bus stand and the Taxi stand. 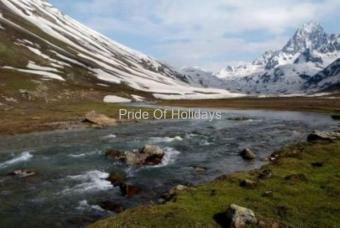 The permit is known in local parlance as "Yatra Parchi" and the permit counter is known as "Yatra Parchi Counter". The counter remains open every day from 6AM to 10PM. 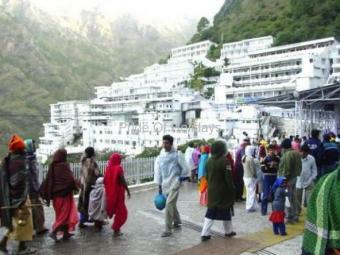 About 18000 pilgrims are permitted to proceed every day on rush days from Katra to Vaishno Devi Ji. A third counter is operated at the erstwhile Mulberry Nursery for the convenience of the pilgrims coming by chartered buses. It caters exclusively to such groups of pilgrims only. YATRA PARCHIS ARE GIVEN TO THE PILGRIMS FREE OF COST ON A FIRST COME FIRST SERVED BASIS. The Yatra From Yatra Parchi Counter to Darshani Darwaza Once a pilgrim is in possession of a yatra parchi he/she is eligible to proceed for the Yatra. The distance from the yatra parchi counter to DARSHANI DARWAZA (it is so named because it is the point from where the yatra is really deemed to commence and thus becomes the doorway or Darwaza for Darshan) is one kilometer. Pilgrims cover this stretch either on foot, or on auto rickshaws or by the bus service which is operated by the Shrine Board free of charge for the pilgrim. From Darshani Darwaza to Banganga The motorable road terminated at Darshani Darwaza. From there the pilgrim has to go forward either on foot or on a pony or on a PALKI or DANDI (Palanquin). The holy Shrines is located at a distance of twelve kilometers from Darshani Darwaza. The entire track from Darshani Darwaza to Vaishno Devi Ji is laid with cement tiles which are very comfortable to walk on. The track is also lit with sodium lights at night. Drinking water points, toilets, rain and sun shelters, refreshment units and vatikas have been provided at frequent intervals for the convenience of the pilgrims. The first station beyond Darshani Darwaza is Banganga. Ponies and Palkis are available for hire at Banganga on rates fixed by the State Government. The yatra parchi is checked and stamped at the Banganga Check Post. This is done to prevent people who do not possess a yatra parchi from proceeding for the yatra. A PILGRIM MUST CROSS BANGANGA CHECK POST WITHIN SIX HOURS OF OBTAINING THE YATRA PARCHI. Banganga is only one and a half kilometre from the yatra parchi counter. The Banganga Check Post remains open round the clock. Banganga To Charan Paduka Two and a half kilometers from Darshani Darwaza at a height of 3200 feet above sea level is the place known as Charan Paduka. There is an impression of Mata's feet on a rock at Charan Paduka. A small temple has been constructed over this rock at Charan Paduka. A number of shops selling snacks and cold drinks have come up at this place. The State Government runs a First Aid Centre here. The Shrine Board has set up a MAHILA MANDAL here. Charan Paduka to Adhkawari Six kilometers from Darshani Darwaza at a height of 4200 feet above sea level is the place known as Adhkawari. The Shrine Board has constructed a large complex at Adhkawari. Free Dharmshalas, rooms on rent, a post office, a medical dispensary, a chemist shop, a bank, a pony stand and a large number of shops are available at Adhkawari. The Shrine Board also runs a Bhojanalya at Adhkawari which is open round the clock every day. Hygienically cooked food at subsidized rates is available for the pilgrims from this Bhojanalya. Blankets are also available free of cost for the pilgrims at Adhkawari. A refundable security amount blanket has, however to be deposited. The security is refunded to the pilgrim after he returns the blankets. The State Government has also set up a Police Post at Adhkawari. Adhkawari to Sanji Chhat Nine and a half kilometers from Darshani Darwaza lies Sanji Chhat at an altitude of 5870 feet above sea level. 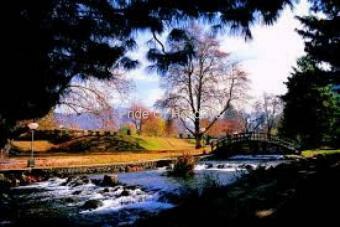 It is a delightful little plateau which affords a panoramic view of the Pir Panjal Range and the Chenab river wending its way majestically to Pakistan. At its feet, as it were, lies sprawled the town of Katra, the base camp of the yatra. Dharmshalas providing free accommodation, a shopping complex and a Bhojanalya of the Shrine Board are available here for the convenience of the pilgrims. Sanji Chhat also has a First Aid Centre. A very large hospital has also constructed for the shrine Board by the Sagar Suri Trust at Sanji Chhat. Two helipads have also been constructed at Sanji Chhat. Sanji Chhat to Bhawan Twelve kilometers from Darshani Darwaza and two and a half kilometers from Sanji Chhat lies the Holy Shrine of Mata Vaishno Devi JI. It is located at an altitude of 5200 feet above seal level. The climb up the mountain ceases at Sanji Chhat. The track levels out and the pilgrims have to trek over a flat stretch for almost tow kilometers before they begin to descend. The descent carries on for almost half a kilometre till one reaches the area of the holy Shrine - the destination of all the pilgrims who throng to Katra in thousands every day. There are a large number of Dharmshalas at Vaishno Devi Ji which provide free accommodation to the pilgrims. Blankets are also available for the pilgrims free of cost. Shrine Board runs a Bhojanalaya at Vaishno Devi Ji which is open rounded the clock. A medical dispensary, a chemist shop, a post office, a telephone exchange, two banks and a Police station also function at Vaishno Devi Ji. The Shrine is open for Darshan round the clock every day except for two hours in the morning (from 6AM to 8AM) and for two hours in the evening (from 6PM to 8 PM) when the AARTI is performed. Clothing Light woollens are required at night even during summer. During the remaining parts of the year heavy woollens are require. How to reach Jammu, 48 kms from Katra, is the nearest airport, railhead and inter-state bus terminus. Buses leave for Katra at 10 minute intervals between 5:30 a.m and 8:30 p.m. During peak season, additional buses are pressed into service. Taxis are available both at Jammu and Katra for the journey. In Jammu city, these can be hired from the Jammu airport, Jammu railway station and the Tourist Reception Centre. 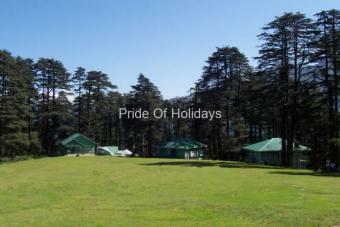 A number of travel agencies conduct tours to Katra regularly from Delhi and other major cities of India. There are also daily scheduled services to Katra from a number of cities and towns of Punjab, Haryana and Himachal Pradesh.